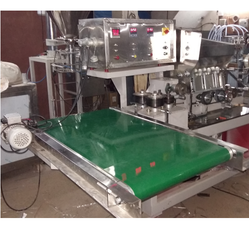 We are the manufacturer and exporter of Automatic Horizontal breading Sheath Flow Wrapping Machines. 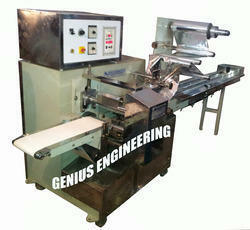 Our Wrapping machine is suitable to pack Sheath, Drinking Straw, pp Pipes etc. The packaging Range is One Unit / Pouch. 25mm (open width) x 450 mm (L). Auto in-feed hopper with Pushers. Any continuous heat sealable laminated roll. 1 HP, 3 Phase (Crompton Make). Approx. 140-150 Pouches per Minute. (Depends upon your product size & speed of manual feeding on conveyor). 220V, AC, Three Phase, 50 Hz. Packaging Details: Sea worthy wooden case. production speed Approx. 50 pouches per min. 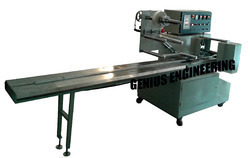 We are the manufacturer and exporter of Automatic Horizontal Flow Wrapping Machines. Our Wrapping machine is suitable to pack Disposable Syringe, I. V. Fluid Set, Electrical, Cosmetics, Hardware, Bakery, Auto Ancillary, Personal Care etc. The packaging Range is One Unit / Pouch. Production Capacity: Approx. 130-150 p/m.